Research in Lawrence Steinman's lab indicates there may be two versions of multiple sclerosis, and that they respond differently to the primary drug for treating the disease's symptoms. (PhysOrg.com) -- There may be two distinct versions of multiple sclerosis, a study in both animal models and human blood samples suggests. What’s more, a patient’s responsiveness to the most popular first-line drug for this episodic and all-too-often recurring autoimmune condition seems to depend on which version that patient has. Beta-interferon’s overall efficacy is only fair, he said, with perhaps half of all multiple-sclerosis patients experiencing an average one-third reduction in recurrences. Plus, its discomfiting side effects — flulike symptoms — can make compliance an issue for patients, especially given the drug’s iffy efficacy. 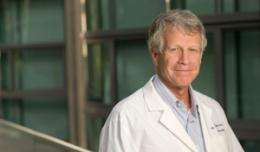 In a study published online March 28 in Nature Medicine, Steinman and his colleagues used an established animal model of multiple sclerosis called experimental autoimmune encephalitis, or EAE, which they induced by injecting the animals with myelin in a way that caused the immune system to inappropriately attack the animals’ own myelin nerve-cell coatings. Many nerve cells in mammalian brains and peripheral tissues must convey electrochemical impulses over great distances, and quickly. Long, wirelike projections that transmit these cells’ signals to other nerve or muscle cells are coated by myelin, a natural substance whose insulating properties sustain the impulses’ strength and increase their speed. A few years ago while still a PhD student at the University of Alabama, the study’s first author, Robert Axtell, had shown that, as in people with multiple sclerosis, beta-interferon can reverse paralysis in mice with EAE. But it turns out that EAE can be induced by two different autoimmune pathways, characterized by different patterns of secretion by T cells. Like nerve cells, immune cells also communicate with one another across long distances, but they accomplish this through various chemicals called cytokines that they secrete into the blood. Immune cells on the receiving end of a cytokine “signal” may respond quite differently, depending on the particular type of cytokine to which they are exposed. Two cytokines called gamma-interferon and IL-17, for example, tend to induce the kinds of inflammatory immune-system arousal that can trigger multiple sclerosis. Axtell (now a postdoctoral scholar in Steinman’s lab), Steinman and their colleagues were able to induce two superficially similar forms of EAE in mice by directing the myelin-attacking T cells to predominantly secrete either gamma-interferon or IL-17, respectively. The researchers found that beta-interferon improved the condition of animals whose EAE had been induced by gamma-interferon-secreting T cells, but exacerbated symptoms in those whose EAE had been induced by IL-17-secreting T cells. Intrigued, the investigators turned to humans. Another postdoctoral scholar in the Steinman lab, Brigit deJong, MD, the study’s second author, had previously been involved in research in Amsterdam in which multiple-sclerosis patients were treated with beta-interferon and meticulously followed up. The Stanford group obtained blood samples taken from 26 of these patients both before and about two years after the initiation of treatment. Without knowing which samples came from patients who had responded well or poorly to beta-interferon treatment, they went about measuring IL-17 levels in those samples. Eventually, patients’ follow-up histories were revealed to the researchers and their measured IL-17 levels were paired with their post-treatment progress. A clear pattern emerged. Measurements of a particular variety of IL-17, called IL-17F, clustered at either very high or very low levels in individual patients’ blood. Those with very low detectable blood levels of IL-17F responded well to beta-interferon treatment, experiencing no relapses or instances of required steroids (to quickly shut down a malfunctioning immune system). But patients with very high IL-17F levels — about one out of three subjects — responded poorly by the same criteria. In fact, said Steinman, there is some evidence that beta-interferon actually worsened these patients’ conditions. Although Steinman and his colleagues do not stand to benefit in any direct way from this work, Stanford University’s Office of Technology Licensing has filed a patent application on the use of the blood test. Earlier work by Steinman, proceeding from animal models to clinical trials, led to the development of another blockbuster multiple-sclerosis drug, natalizumab, marketed under the trade name Tysabri. I wonder if the excellent responses seen to low dose naltrexone is specific to one type MS or the other?